Welcome to Cheap Eats NYC, where every week, we'll be highlighting an incredible NYC meal for less than $10. Know of a great all-you-can-eat Indian buffet, under-the-radar burger, or other cheap eat in the five boroughs? Let us know in the comments! Bodega culture is a real thing: Every New Yorker has her go-to, and it's an integral part of day-to-day life, whether it’s for a toilet paper emergency, a late-night snack, or a quick stop for milk to avoid the line at Trader Joe’s. But there’s one bodega in particular that stands out among the masses for a single sandwich: Harlem’s Blue Sky Deli (aka Hajji’s) and its chopped cheese. The sandwich -- often described as New York’s answer to the Philly cheesesteak -- is stacked with griddled and chopped ground beef and melted American cheese, then topped with peppers, onions, lettuce, tomato, ketchup, and mayo on a pressed hero. 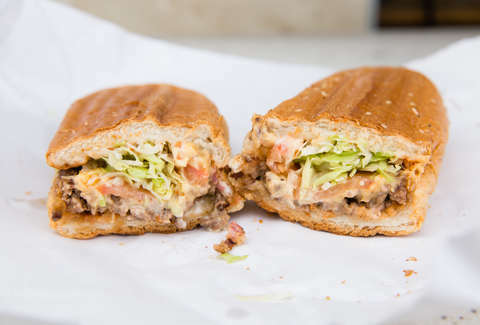 The chopped cheese has allegedly been around since the ‘90s, but it’s only recently started to gain popularity outside of Harlem and The Bronx. Last year, First We Feast conducted an in-depth dive into the sandwich and its roots, and the Bodega Boys sung its praises on their podcast and Twitter feed. It even got the upscale treatment -- at April Bloomfield’s White Gold Butchers and Whole Foods (much to the dismay of bodega-loyal New Yorkers). Hajji’s chopped cheese in particular has been referenced in rap lyrics, and by the The New York Times, which also noted the bodega’s conscious efforts to establish itself as the sandwich’s creator. Whether Hajji’s is indeed the de facto birthplace of the now-widespread sandwich is moot; the point is, it does it the best. The melted cheese perfectly coats each small, juicy bite of ground beef, the toasted hero adds a nice crunch, and the overloaded toppings make for a beautifully messy, filling sandwich -- all for $4.50. It functions just as well as a quick to-go lunch as it does an end-of-a-night-out savior (or, by that same logic, the essential hangover meal, with powers even greater than those of the bacon, egg, and cheese). Yes, you can find a chopped cheese at countless bodegas uptown -- just like you can find similar breakfast sandwiches and a hundred other like-items at virtually any small corner store citywide -- but Hajji’s is the one that every chopped cheese should be judged against. Lisa Elbert is an associate staff writer for Thrillist who takes sandwiches very seriously, because you don’t win friends with salad. Follow her on Twitter and Instagram.